“Dismissed with outright contempt”. This was the common response of Muslims all over to Sri Lanka Muslim Congress Chairman Basheer Segu Dawood’s demand for a separate Muslim Province. During a discussion on the proposed constitution in Kattankudy on Saturday 20 February 2016 Segu Dawood had said Muslims cannot give up their demand for a separate Muslim Province. As rightly pointed out by former Information Minister Imthiaz Bakeer Markar in a television interview this was a totally outdated and unwanted demand irrelevant in the current highly communalized political environment. The government is taking numerous measures to bring about some degree of harmony among communities in the country. People in general welcome these measures. At a time like this Segu Dawood who started his political career with EROS before joining SLMC coming out with a demand for separate Muslim Province is suicidal for the Muslims living scattered all over the island. Muslims all over the island were furious. They were swift in their condemnation as such a demand in the current political environment could only fuel the ongoing racist campaign against Muslims. Memories were still fresh in the minds of Muslims who were brutalized by defeated president Mahinda Rajapakse regime which ruthlessly employed racist elements to unleash well organized violence against Muslims. Segu Dawood was an integral part of this very same Rajapaksa regime which persecuted Muslims. The question is why didn’t he raise this issue when was with Rajapaksa regime? Mr. Dawood had said that the SLMC’s stance was that the Muslims need a separate Province and the SLMC late founder too had endorsed it. In a letter wrote direct to Segu Dawood Aman requested Segu Dawood not to distort historical facts for his personal benefit. “During the early course of his political voyage, Mr. Ashraff said if and only if, the Tamils of Sri Lanka were granted a separate state,then it is only fair that the Muslims of Sri Lanka also be granted one as well. However, his political views had changed over time. Addressing a gathering of the SLMC High Command and Politburo members at the Taj Samudra Hotel late Ashraf stated that “As a party representing a minority in this country, we have reached the limits of our abilities. If we are to serve the nation and its people at a greater degree, we must then, look to expand our horizons into national politics and aim to define a role for ourselves within. Thus, he began to devote his career and time exclusively towards the formation of the National Unity Alliance (NUA) a pluralistic political entity whose mandate was solely for a UNITED Sri Lanka, undivided by any means. You know this well, because you were one of the few who did not agree with this new and rapidly evolving political vision of Late Ashraff, which is why he did not appoint you to the High Command of the NUA. He was well aware that you lacked the political maturity then (and still do now) to realize that a divided nation will forever be a defeated nation,” thus concluded Aman. I was flooded with phone calls and e mails by both individuals and organizations alike ever since this report appeared in the local media expressing alarm at the demand. Here are their serious concerns. One pointed out that Muslim politicians especially from North and East should stop talking of Islam and Muslims as they had brought enough disrepute to Islam and Muslims by their immoral and wheeler dealer politics for personal benefits. One should not forget that the Muslim community en masse voted for President Maithripala Sirisena in the 8 January 2015 presidential elections on their own and on the advice of any politician. 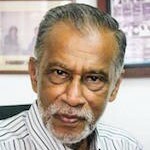 Muslim community had paid a heavy price for SLMC’s corrupt politics. Ridiculous state of affairs is such that SLMC which came with the slogan of Islam and Unity is divided into more than half a dozen groups. So much so the SLMC leader was dispatched as salesman this month by Prime Minister Ranil Wickremsinghe to Turkey to promote Sri Lankan tea. Under the circumstance beleaguered Muslim community cannot allow politicians like Segu Dawood to continue their out dated proposals which has all the ingredients to damage relations between Sinhalese and Muslims. Over the years today the SLMC is a discredited party and SLMC politicians managed to get into the government only due to a deal with the United National Party to enjoy positions and perks and not to serve the community . In a letter to Bahseer Segu Dawood one Muslims said “you are frustrated person as you were not being nominated through national list by your leader Rauf Hakeem. Separate Muslim province for what? Create more corrupt Muslim politicians? he asked.